Which cat to rehome was not a straightforward decision. Belle had been with us for over two years, and Joni for only two months. 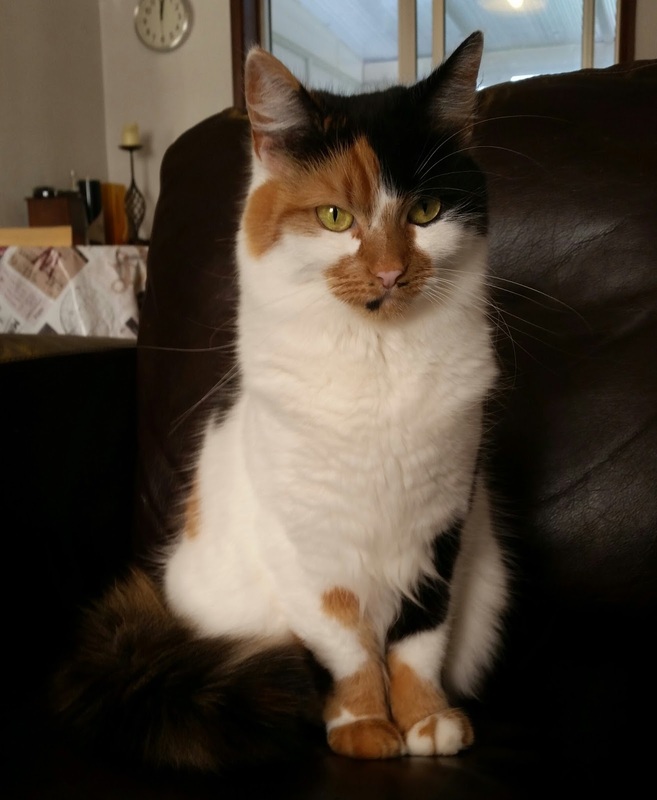 We love Belle; she has never been the most affectionate of cats, but in her own way she developed a bond with us. Her first eighteen months with us and Dexter were very happy for everyone involved. Belle and Dexter in better times. Sadly, after Dexter passed away things started to go wrong for Belle. We think Dexter gave her some protection from other cats outside; afterwards, she was much more stressed about going out. Then we adopted Freddie over the summer, and had to give him up when he was aggressive towards her. These experiences have taken their toll, and it's clear Belle can no longer live with other cats. A more serious problem was Belle's relationship with our baby son Zach. She was understandably afraid of being grabbed by him, and stayed as far away as possible, but sometimes he would get close when she wasn't looking. We became concerned that one day she would lash out at Zach the same way she did with Joni. Zach was stressful for Belle. She hadn't really been herself since Dexter died. Even for the few months when she was our only cat, she was withdrawn and less playful than before. Instead, she spent a lot of time hiding in the rafters of the garage. The situation would have got worse before getting better; Zach is getting more mobile by the day, but it will be years before he really understands the need to be gentle with a cat. Joni, on the other hand, is remarkably tolerant of Zach. Maybe it's just her nature, or maybe it's because she recently had kittens of her own, but she is very calm and patient with him. She's far from perfect: She claws the furniture when she is stressed, tries to steal our food, and eats some things which are not food (she has a particular taste for Zach's dummies); but none of these are deal-breakers. Both Belle and Joni are young and in excellent health. Whichever one we kept could easily be with us for fifteen years or more, so this was a long-term commitment. In the end, we decided Joni would fit into our family much better than Belle. It hurts to give Belle up, and we will miss her; but she deserves a calm and peaceful home, without babies or other cats, where she can be happy. I have nothing but praise for how the Blue Cross is handling Belle's rehoming. They were very caring and understanding of how difficult it was. They also spent more than an hour interviewing me about Belle's history and behaviour, to understand what kind of environment she needs. I know she is in good hands. She is a beautiful lady, and we are confident she will find a new home soon. Belle last week. Still a beautiful lady, but a very stressed one. Life goes on, and we are very lucky to have Joni with us. She is much happier now that she doesn't have to watch out for Belle, and is curled up around my feet as I write this. Now, we can move forward as a family without so much stress. We want Zach to have a good relationship with our pet; he should see our cat as friendly and playful, not mean and scary. Already, we have seen Joni can give that to him. We are done adopting cats for the time being. 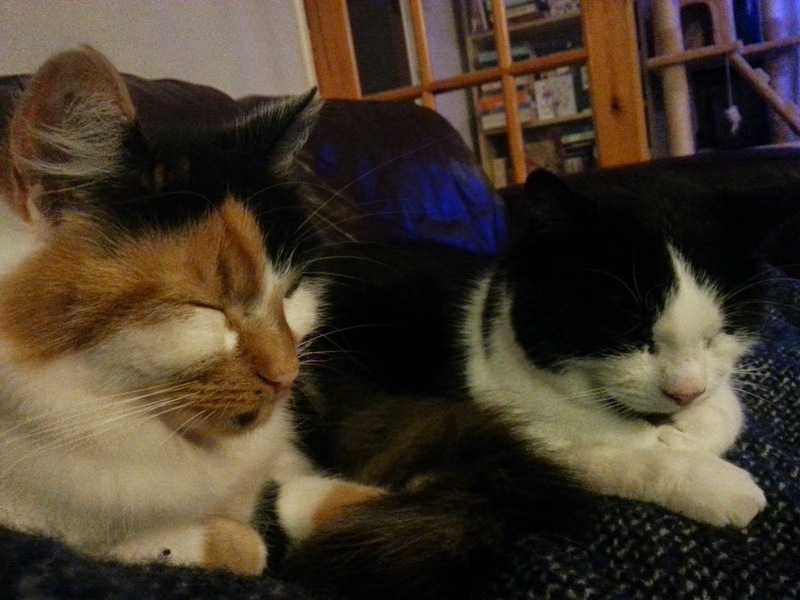 It looks like Joni could live with another cat happily, but she will be equally content on her own. After the experience with Freddie and now this, we do not have it in us to wrangle hostile cats for a very long time. Maybe in a year or so we'll see where we stand. Meanwhile, we will be a single-cat household. Goodbye, Belle. We wish there was some other way. It's terribly sad to give you up, but we know you are a wonderful cat; we hope you and your new humans give each other many years of happiness. Belle is now with the Blue Cross animal shelter in Cambridge. She will appear on their website soon, most likely on Thursday the 21st of January; please contact the shelter if you are interested in adopting Belle. Update 2016-01-22: Belle is now listed for adoption at the Blue Cross. We hope she finds a good home soon. Update 2016-02-18: A couple of weeks ago, we learned Belle had been adopted. We wish her a long and happy life with her new family.